It's a wealth of discussion this week as Manu Saadia, author of Trekonomics, joins the show to talk about what's in Picard's wallet! The "no money" economy of the Federation has always been one of its major selling points, but how would a system like that actually operate? Manu and I discuss the "economic plumbing" of the UFP, as well as what it might take for us to reach a similar economic reality. We also touch on "unlimited cookies", the ... See More responsibility of ownership, reputation as currency, the socioeconomic benchmark of smoked salmon, wielding soft economic power, and how the Federation could buy the entire galaxy without breaking the Bank of Bolius! Plus, we've got news about Discovery Season 2, a report from last weekend's screening of the DS9 Documentary, What We Leave Behind, and we look ahead to this weekend's Destination Trek in Birmingham! By Spock's beard, this is a great episode! Bone up before the documentary with Paula and Terry's Deep Space Nine Companion and see her pics from the screening! Listen to our "Runaway" recap show! 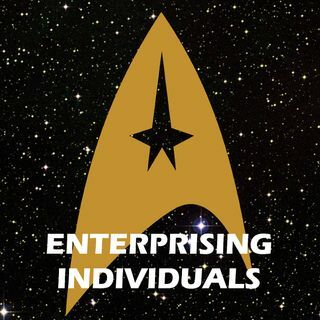 Get updates from Ella from Destination Trek! Suit up with our new T-shirt!